Regardless of what their press junket claims, this Buckingham McVie album (out today) was intended to be a Fleetwood Mac disk. Until they opted for it to be a "duet" record (which it is not), they had talked about Stevie Nicks' reluctance to join the band in the studio. To read any of their press now, Nicks' name is almost never mentioned and the tagline is that it was always slated for a duo album. We call this "spin" or publicists working overtime. Nicks was reluctant to participate. She claimed she didn't want to spend over year in the studio to make an album which people wouldn't buy. Though that came from she doesn't think people buy music anymore......and she has a certain point to that. But with that logic, Nicks kind of showed herself as not being as true of an artist as she claimed and someone who wants to make a buck off her songs.....which is legitimate too....though it's a little harder to swallow from a person who has a net worth of some $75 million. Now you just sound bitter and greedy. So the rest of Fleetwood Mac kept making the record they were semi-planning, but with one less member, and opting not to call it a Fleetwood Mac disk. While Nicks' reasoning was off / wrong - her gut on not joining was on the mark. I wish my wallet could say the same thing. 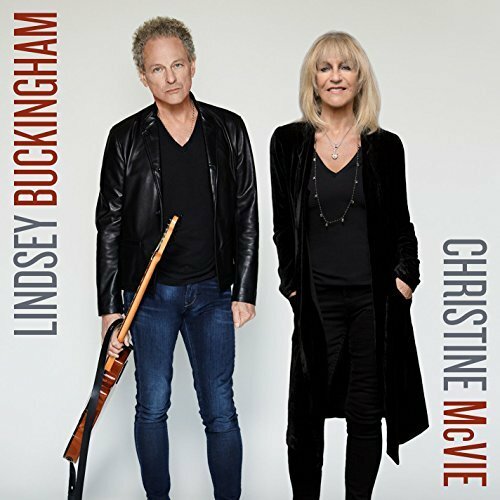 Back in the day, "Don't Stop" notwithstanding, Lindsey Buckingham and Christine McVie had some of their best work together: "World Turning", "Hold Me", "Think About Me", "Isn't it Midnight" and "You and I". Those moments are few and far between here. There are some fine songs, some missed opportunities and some just forgettable moments. Stop calling it 'duets' when they rarely sing together. They trade off tracks in which one takes the lead. Buckingham's songs are just that. You'd really need to isolate vocals to hear if McVie even participates on most of them. It might be telling that the opening track, "Sleeping Around the Corner" was a bonus track for Buckingham back in 2011. It's not a bad song, if you can get past the opening 30 seconds or so. Buckingham, as usual, has repurposed his solo work for it to be a 'band effort'. And while he used John McVie and Mick Fleetwood for a solo disk that became this one, it doesn't seem that these songs were written or arranged for something like......oh, say, harmonies, which is somewhat of a band staple. His songs still feel like a solo effort. As with a lot of his later work, Buckingham loves layered vocals....especially if they're his vocals ("Love is Here to Stay", "In My World"). And he likes that jangly guitar. There used to be a time when he mixed it up with guitar style......those are rare times nowadays. That said, his playing ability is still stellar. When the first three tracks were released prior to the disk, I had grim feelings about the album. If "In My World" contains Christine McVie at all - on keyboard or vocals - I am missing it. And auto-tuned Lindsey? To quote our pseudo-president, "Sad!". McVie's song, "Feel About You", is lighter than light rock...even for her. It's Helium Rock. The problem really with it is: it has a hook, an earwig, if you will. But it's not necessarily a song you want stuck in your head........but there it is. And I know I'd be in the minority, but her "Game of Pretend" is way too melancholy and piano heavy - like someone is trying to recapture "Songbird" way too hard. McVie does have strong vocal skills ("Red Sun"). She hasn't seemingly lost that with her very extended break and being in her 70s. She hasn't really lost her range. Both singers have better offerings on this album....and oddly, they're the last two songs. McVie's "Carnival Begin" makes you want more of this type of song (though the organ is almost identical to "I'm So Afraid"). Again, the arrangement and phrasing are familiar enough, but with a departure from the norm that make it interesting. This is where Buckingham shines on guitar - unfortunately it is the literally the last minute of the entire disk. Both of these artists have worked well when playing off each other.....but on Buckingham McVie, they're just filling in for each other. More songs like the final two would have made for an incredible album. I don't blame Stevie one bit. Why on earth put herself out there at this stage? And she's done duets with about everyone out there. She doesn't need those two!